A Full Bust Adjustment (FBA for short) is the one adjustment I know I’m always going to have to do if the pattern is in any way fitted below the neck. They’re quite straight forward and well documented if you’re altering a pattern for a woven fabric. You manipulate and/or create darts to add the extra length and width you need to go around and over the chest whilst still keeping the shape of the garment. The Renfrew pattern is designed for knits. Whilst it would be possible to do a standard FBA and add a dart to the pattern, it’s not something I want to do as the dart will add bulk, could affect the drape and well, I’ve never seen a dart in a t-shirt! Now, if you’re like Lauren who blogs at Lladybird and you have the option of grading between sizes to accommodate your full bust which is what she does, this is a solution you will want to consider! Lucky me (insert sarcasm here depending on your point of view…) has to deal with a G cup. In plain old inches there’s a 5″ difference between my high bust and full bust measurements. I also start at the top of the Sewaholic size chart so there’s no option of grading between sizes as my high bust is 41″. 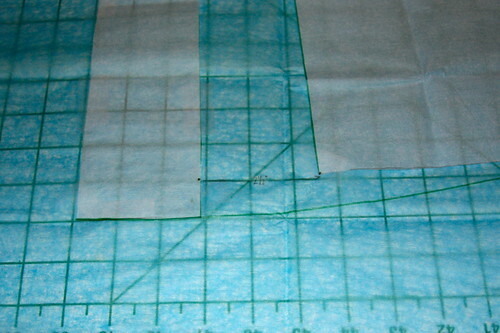 So I need to do a FBA of 2.5″ or maybe 2″ if I don’t mind taking 1″ of ease out of the pattern… Because it’s such a big adjustment I always trace my pattern and work with the tracing. That means if I get anything wrong, the original is intact and I can start again. These are the steps for my FBA on the Renfrew Top. 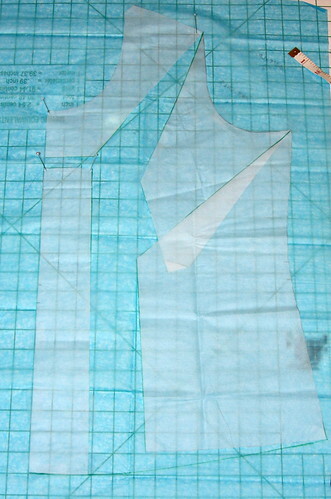 I’m using pattern piece A – the front bodice piece for the scoop or cowl neck versions. The traced and cut out bodice is on top of another sheet of tissue paper so that I can stick it down once its slashed, spread and adjusted easily. 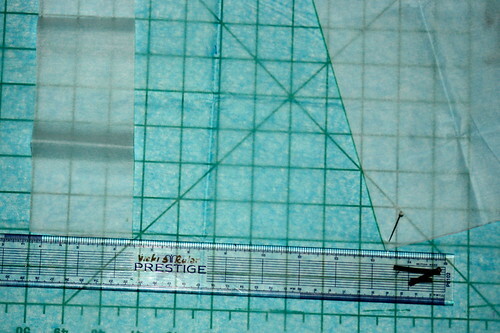 The green lines mark where I’ll slash the pattern. The change in direction is about 1″ above my bust point as I know it will drop when I do the adjustment. I leave a hinge point near the shoulder. Here is the slashed and spread pattern. There’s a gap of 2.5″ between the vertical slash on the left and the point of the slash lines on the right. You can see how this has moved the angle in the line down, lowering the bust point. 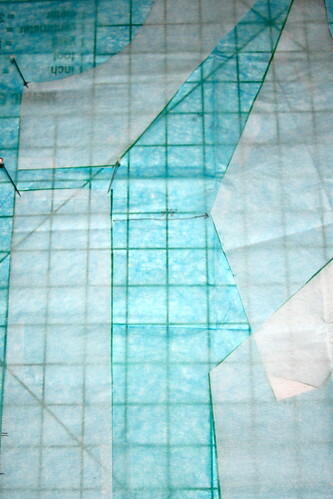 I marked the point where the bottom of the pattern came to and then brought the slashed centre front down to meet it. Now I need to get the side seam back to where it was, other wise the bottom of the top is going to be very flared and have no resemblance to the original design. 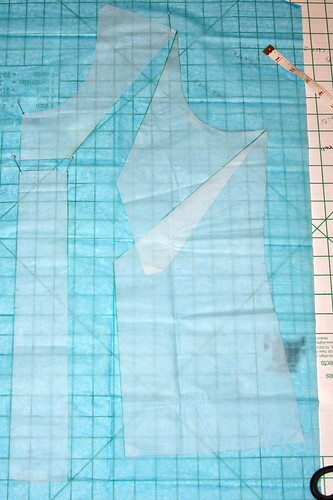 To do this I put another slash into the pattern, pivoting at the point where the arm scye and side seam meet. There was no science to where I chose for this I’m afraid! I brought the side of the pattern in until the bottom corner was 2.5″ from the vertical slash line – the same amount of width we added at the top of the pattern. The bottom of the pattern pieces do not in any way match up. There’s about an inch difference in length and we need to true this up some how. I used a french curve to draw a smooth line between the bottom of the centre front of the pattern piece to the bottom point of the side seam. I’ve now added the length and width I need to get around my chest. 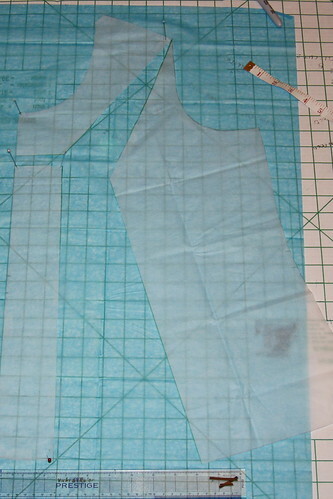 The side seam length has been maintained so it will match the back bodice piece. The extra curve to the hem is cancelled out as the fabric travels over my ermm, contours?! 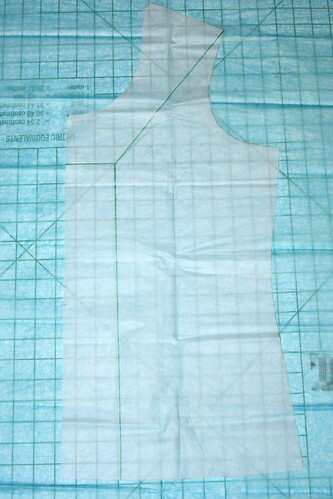 Finally I measured the new length of the bottom of the bodice and compared this to the original pattern piece. The length had increased by just over 2.5″ (almost the exact amount added for the FBA) so I slashed and spread the waist band of the pattern to match between the ‘place on fold’ marking and the notch half way along. One Wearable Muslin with a Successful FBA! Look, No strain lines, even when sticking my *ahem* chest out and flailing my arms about! By the way, the cowl in the picture is smaller than Tasia’s design as I had an idiot moment when cutting it out and missed a chunk off one of the pieces. I have no idea how I managed it, but hey it’s still wearable! Please please chime in if you’ve got any advice, observations or refinements that may help me or anyone else doing this sort of adjustment in a knit! Vicki, this looks great! I love the fabric that you chose, and it’s so wonderful that you can customize this to your body. (Though I won’t be in any need of your tutorial, as I am more in need of a DBA – dainty bust adjustment) – and I think I can get away with not needing that for this top. If I’d had the option of using lladybird’s grading option I would, unfortunately I need so much extra room it’s ridiculous! I do need to narrow the shoulders a little on the next one though as the seam is falling onto my arm. I still love this version though! This is so cute! Love the polka dots, the color, and the perfect fit! Great job! I am making my Renfrew up in an advanced knits class I’m taking. While I am normally able to get away with omitting my FBA’s when working with knits, this time I followed the golden rule (Palmer Pletsch’s – Fit for Real People). Since I cut a smaller size, I actually ended up needing to do a 5″ Y-bust adjustment. If it sews up well, this will become a TNT pattern for sure. I’m with you on the NO darts for knits. Your version looks amazing. Thank you for the compliment! My adjustment was on the limit of what I could do without going for the Y adjustment. I quite often use it on other tops though. I really really wanted to avoid a dart which I’m glad I managed as this knit is so drapey I think the weight of the dart would have done something weird to it. But maybe not if the bulk of the dart was cut out so it just left the seam… I’d love to know how you go with your top, your class sounds fantastic! That looks awesome! Thanks for the comprehensive pictures. 🙂 I’m going to need to do a FBA to a knit pattern, and was wondering how to approach it.. I hope it helps you out Kris! Me too! They’re the whole reason I spent so much time on working out how to FBA this top! I’ve always struggled with FBA’s on dartless bodices but this looks so straightforward (thanks to your excellent instructions) that I’m slapping myself on the forehead that I didn’t work it out. Thank you for sharing. I’m going to give this a go on my next dartless top. I really hope it works for you! It did take some head scratching and a lot of ‘mini’ bodices to get it right. I can’t tell you how pleased I was when the top worked out the way it was supposed to. I’m sure it will. Your top looks fabulous. I loved all your versions, and thought the franken-top worked really well! I hope it helps out in the future. Sorry I took so long it posting it, for some stupid reason, even after I’d worked the adjustment out and taken all the photographs of the pattern alteration I then got scared of sewing my first knit anything! It does go together ridiculously fast though, so more will be on the horizon I think… V neck next maybe? This is so great! I do have one question for you- instead of pivoting the right slashed pattern piece back towards CF to maintain the SS shape (so that the hem wouldn’t be flared) could you just eliminate it from the side seam at bottom opening (tapering to 0″ at side seam). Just a question. Pattern alterations an be done many ways. Yep, you could do! It was such an enormous flare for me I was worried I wouldn’t draft the waist line curves accurately so elected to pivot to maintain the pattern. If it was a smaller flare I’m pretty sure I would have just drawn it in. I’ll have to investigate the last photo! I started with my high bust measurement and went from there… Hope that helps? Thank you for posting this tutorial.. I need a similar FBA as well and that dart was bothering me,… you’ve shown me a great way to rotate the dart out. I’ll give this a try and let you know how it goes. THANK YOU for sharing so clearly how you handled this, it’s the best FBA explanation I’ve seen! I just bought this pattern, and am nervous about starting. Not much recent experience with knits, so it’s going to be an adventure! Really enjoy reading your blog. Pingback: Pattern Fitting Adventures - Sew All The Things! I can see all the technique photos, but not the one of you in your top. I would love to see it! Thank you for the tutorial. Using your method, I just did my first successful FBA!! Thank you SO much!